While British Airways (BA) is the largest airline in the UK, Americans are much less familiar with the brand and its distinct character. To bring the airline’s personality to life for U.S. travelers, it partnered with The New Yorker, a classic American institution, to create a native cartoon program that illustrated the unique personality of British Airways in a place that was familiar to their core audiences: Empty Nesters. The custom program centered on new empty nesters Sam and Karen embarking on their first kid-free European vacation. After being greeted by a BA flight attendant, viewers decide what Sam and Karen do next, including the sights they see, the cities they visit and the activities they do. Each decision is followed by additional user input that decides the next leg of their adventure. 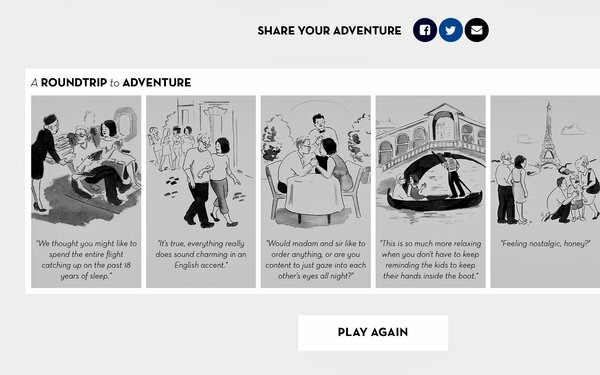 Once complete, the native page displays a six-frame cartoon strip documenting Sam and Karen’s full adventure, with an option to play again that allows them to experience the 14 different cartoon journeys — all created by New Yorker cartoonist Emily Flake. In addition to the native homepage, these cartoons were also featured in promotional assets designed to drive traffic across display, social, and newsletter activity. Americans responded enthusiastically to BA’s activation. The native landing page over-delivered traffic expectations by 122%. Over 33K social engagements with positive social sentiment. A 13% lift in unaided awareness. A 10% lift in purchase intent. Promotional drivers, such as social and display assets featuring cartoon imagery, achieved a 70% ad differentiation score, with 38% of the surveyed audience agreeing that BA understood them and their current life stage. Engage your target audience with online interactivity for an entertaining and educational experience. Make sure your media partner is one familiar to your intended audience. Beside a native homepage, use promotional assets to drive traffic. This won the Native Marketing category in MediaPost’s 2018 Creative Media Awards.